The town of Neath and its surrounding area have a history that go back to the Bronze-age. 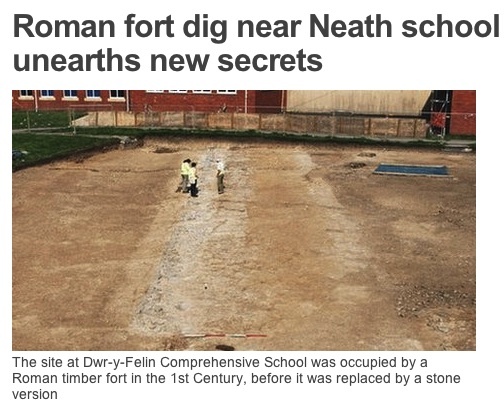 The Romans constructed a fort in an area near the former Neath Grammar school which had the Cwrt Herbert playing fields as part of the area it covered. Recent excavations in the playing fields revealed stone foundations to confirm the Roman past - see picture above. The history of the town itself commenced early in the 12th century with the Norman Conquest of Glamorgan. Following a castle structure at Neath Abbey in 1129, which was later destroyed by the native Welsh Lords, a second castle was built on the East bank of the River Neath, the site of the present castle remains (right). The Normans developed a small village with market and church in the area around 1150, which later formed the basis of Neath Town. A river bridge was built in 1320 and this resulted in increased trade with regular markets. The Tudor period saw the emergence of a class of people who took control of trade and economic growth with a body of councillors to govern the town. Around the 16th century coal mining and copper smelting commenced around the area and at Aberdulais in 1584 where 'water power' from a waterfall was used to great advantage. Although Neath was a small town around the castle and church during the 15th and 16th centuries, vast changes were to be seen during the 17th and 18th centuries. A small coalfield was developed by the Evans family of Eaglesbush in the lower Cimla area, which was later enlarged by the Mackworth family from Derbyshire. It was this family that constructed one of the largest and most modern copper smelting works in the country at Melincryddan in 1695. The fact that a vast supply of coal was needed in the smelting of copper, the area became very successful. Bars of copper (termed pigs) were transported to the Gnoll mills where the rolling and pressing process made possible the manufacture of pots and pans. Neath, along with Briton Ferry, became highly industrialised communities and a major source of employment. Briton Ferry had its own council in the 1700/1800’s, and was independent to Neath. The council offices were at the public library pictured left. The town developed as an industrial community to a greater degree than Neath with its Docks, Iron and Steel works and tinplate works, not forgetting the Giants Grave ship breakers yard where giant ships were broken up and their steel recycled at the town's two steel works - Briton Ferry Steel Co (which became known as Briton Ferry old steel) on one side of the docks and the newer Albion works on the other side. Both these works closed after The Steel Company of Wales Ltd was formed with development of the Margam and Abbey works in the 1950's. The dock at Briton Ferry had a single dock gate designed by Brunel. It is claimed that at it's height in 1870 over 2,500 ships used the port in one year - it was mainly coal ships but they had the odd passenger cruises arranged by the Sunday schools and working men's clubs. This figure works out at between 6 and 7 ships per day and may be somewhat exaggerated to show how busy the dock was. The dock was closed in 1959, but since then there has been a move to make it into a marina. The Neath and Tennant Canals are two independent but linked canals going through Neath, being linked at Aberdulais. The photograph on the left shows the Tennant canal aqueduct, built in 1824, crossing the river Neath at Aberdulais. It is not generally known that there are more bridges in Aberdulais for its size than anywhere else in the UK. The Neath Canal was opened from Glynneath to Melincryddan in the south of Neath in 1795, and extended to Giants Grave in 1799, in order to provide better shipping facilities. Several small extensions resulted in reaching its final destination at Briton Ferry in the Iron works area of the town. At one point the canal ran along the side of the Briton Ferry tinplate works for which it provided cooling water for the process which envolved much heavy manual labour. The canals had a big influence with industries and the dependance on coal as a fuel. Brick making and chemical production in neighbouring areas, including iron manufacturing at Neath Abbey. Neath’s population, which was only around 3,000 in 1823 increased to 4,000 by 1849. In 1949 the figure was rapidly approaching 40,000 and at 2012 is said to be 47,000. The heavy manual labour, especially in the iron, steel and tinplate works, resulted in much perspiration and the need for replenishment. This gave pubs much business except for Sundays when they where closed due to a law made in 1881, which was later repealed in 1961. Clubs became popular in the area because they were open on Sundays, being exempt from the licencing law. Dozens of pubs, many with unusual names, disappeared as times and conditions changed in the 1930/40's. In 1830 Neath had its own brewery at Cadoxton, known as the Vale of Neath Brewery until the business was renamed Evan Evans Bevan Ltd after being bought in 1850 by Evan Evans (1794-1871) of Briton Ferry. In 1860 it was said to be brewing 1,000 barrels a week. It was taken over by Whitbread Breweries in 1967 and ceased brewing in 1970. Contrasting with work, chapels and Sunday schools were well attended during the industrial revolution with no entertainment, sport or pubs open on Sunday. On the Whitsun weekend, Sunday schools would march through the streets with a Whitsun tea treat and the end of the event. Crime was rare and houses rarely had locked doors during the daytime. At Christmas time carol singers were welcome callers, and on Guy Fawkes night a penny for the guy meant a great deal for youngsters who had taken the time to create a dummy that ended up on a big bonfire. On the west side of the river Neath at around 1806 there were coal mines at Bryncoch and Dyffryn (left) which added to the wealth of the area. Between 1897 and 1918, the collieries produced over eight million tons of coal, but production went into rapid decline during the 1920's and were finally closed down in 1929. Going back to the 1800's, an industrial area developed at Melincryddan with the Melyn forge and foundry, including the Melyn tinplate works in 1864 and the Eaglesbush tinplate works in 1890 followed by the Neath Steel Sheet and Galvanizing Company in 1896. Before the days of steam numerous horse-drawn tramroads were constructed in the area at the time leading up to the Industrial Revolution, chiefly between the years 1790 and 1830 and connected with the iron, copper and coal-mining industries. Horses and small ponies were used in coal mines, some never seeing daylight for the whole of their working life. The arrival of the steam railways made a major expansion to the population growth with the South Wales Railway in 1850 and the Vale of Neath railway in 1851. The Rhondda and Swansea Bay Railway had a station in Cwrt Sart before crossing the River Neath to Swansea via a swing bridge in 1894. A recent photo of the bridge is shown right. In 1895 a branch line was made to Neath, arriving at a station which was then called Neath Canel Side. The mention of the South Wales Mineral Railway must be included because of its major contribution to the wealth of the area. 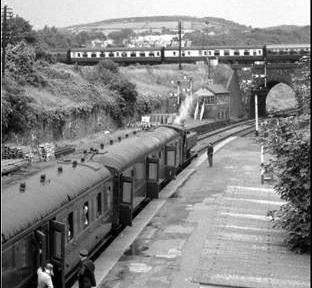 It opened in 1861 and ran from Tonmawr to Briton Ferry by means of a long incline (pictured left) that ran partly through Jersey Park to join the sidings near the main line railway. The line was later extended to transport coal down from the Glyncorrwg Colliery. It was sold to the GWR in 1908. The line from Tonmawr to Briton Ferry was dismantled in 1910 with the coal from Glyncorrwg being diverted to Port Talbot until the colliery was closed in 1925 - the same year as the Jersey Park opened in Briton Ferry. On the right is shown the route of the railway as it went through part of the park. Just outside Neath in 1921 another piece of history was being made that would change the dependacy on coal to oil. It would also lead to an international situation some years later. It was a new oil refinery sited at Llandarcy near Skewen by the Anglo-Persian Oil Company Limited, which opened in 1922. It was built in order to treat imported mineral crude oil. It was the first large commercial oil refinery to be established in Britain, although large scale operation did not occur until after 1945. Llandarcy was actually built as a model village in which to house a number of the refinery workers and for a number of years the refinery was also known as Skewen refinery. The distributing company of the Anglo-Persian Oil Company Limited at Llandarcy was later known as the British Petroleum Company Limited - having its logo at its entrance. Prior to 1960 oil was imported through the docks at Swansea but in 1961 a pipeline from the refinery to a new terminal in Angle Bay, Pembrokeshire was built and most oil arrived at the refinery by that means. In 1985 the refinery at Llandarcy was restructured as a specialist refinery and the pipeline to it from Angle Bay in West Wales closed. The refinery ended up being a focus for a significant petro-chemical industry in the region. The refinery ceased operation in the early 2000's and the BP Baglan Bay Chemical works, which relied on feedstock from Llandacy, closed down a short while later. In the 2000's another big change took place with gas taking over from oil. A pipeline was built from Milford Haven to Gloucester with a pressure reducing plant at Cilfrew on the outskirts of Neath. On the Baglan Moor BP Chemical site a gas fired power station was built, highlighting the change in energy sources. The Metal Box company, founded in 1921, specialised in manufacturing metal containers. Anticipating a boom in the industry in the 1930s, the company secured a tinplate works at Eaglesbush, near Neath, to supply their factories. It was expected that the works would employ around four hundred men at a time when many were unemployed and, in the period before the Welfare State, in desperate need of work. When the idea of canned food took off, Metal Box soon built their manufacturing plant next door to the tinplate works. All the tinplate and galvanizing works started disappearing years later when one of first UK's strip mills (typical mill pictured left) came into operation at Ebbw Vale in 1936. Later, in 1951, their fate was totally sealed when the Steel Company of Wales (formed in 1947) opened their strip mill at the Abbey Works at Margam in 1951, absorbing much of the labour from the redundant tinplate works. In the mid 1950's the labour force at the Abbey Works peaked at around 18,000 (now in 2000's it's around 4,000). The 1950's were the days of full employment with jobs even made for disabled men in the form of mess room janitors and level crossing attendants - even so, the company made healthly profits until the late 1960's. The restructuring of the steel and tinplate industry in West Glamorgan, with satellite tinplate works at Trostre and Velindre meant the end of much heavy manual labour that existed in earlier times. The mention of The Steel Company of Wales is to explain the closure of the numerous tinplate works in Neath, Briton Ferry and other areas. After being nationalised and then returning to private ownership, the Margam -Abbey Works became owned by Tata Steel in 2010. Apart from industry, Neath became a prosperous commercial centre with many notable civic buildings gracing the town: The old Town Hall in 1820, the new market in 1837 (the year that Queen Victoria came to the throne), the Mechanics Institute in 1847 where Alfred Russel Wallace worked on his ideas on the evolution of man. 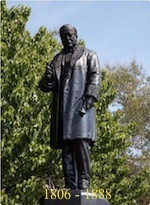 Other buildings included: Alderman Davies School 1858, St.David’s Church 1866, Gwyn Hall 1887 and Victoria Gardens in 1897 where the statute (shown right) was repositioned in 1967 to face the building across the road named after him. It was during the first quarter of the 1800's that gas lighting on the streets and in dwelling houses became the standard means of illumination in the hours of darkness. Neath had its own gasworks for making gas from coal. It was only in the 1920/30's that houses were beginning to be converted to electricity with many streets having overhead lines that still exist today. It was not until after the war (1939-1945) that streets really began to benefit from electric lighting. In the late 1800’s - early 1900's residential areas of Neath spread with many new neighbourhoods like Caerwern, Cimla, Westernmoor, having the town centre as its hub for shopping with many streets retaining their old names and portray the nature of the town, such as: Duck Street, Cow Lane and Cattle Street. The Great September Fair was established in 1880, according to the NPT Council website, but further research reveals that the origin can be traced back to the original Charter granted in 1280 - and is the oldest and perhaps the most prestigious fair in Wales, owing its origin to the granting of the Charter by Gilbert de Clare, the Lord Paramount of Gloucester and a Marcher Lord for whom Neath was a garrison town. The fair became a regular event from the above mentioned dates and held every year on the second Wednesday of September - Wednesday being regarded at the town's weekly market day when the cattle market was a hive of activity for local farmers. Originally it was said that it was a Thursday (the town's original early closing day) when the September fair started, and even today residents feel it is that day when the fair gets into full swing. The September fair became an important event to Neath in its development, because until a hundred years ago, there were very few permanent shops as we know them today. Most buying and selling was from temporary stalls by local farmers. Traders from all over the UK, have been attending this four day event, with products ranging from various textiles, bulbs and plants, china and pottery and many more making the total of up to 140 stalls, around the streets of Neath Town Centre. The council found the stalls an additional source of income, with a charge per foot for the size of the stall. The Briton Ferry & Neath Co-operative Society (1916-1975) originated in Briton Ferry and later expanded to Neath where in the 1950's they opened the town's first supermarket in Alfred Street. With over a dozen branches of varyng size in the Borough (Neath and Briton Ferry), they ruled the roost in the grocery and butchery business until their demise in the in the mid 1970's by which time Tesco were on the scene with a supermarket in Queen Street. Tesco have since concentrated on large out of town stores. The Tesco store at Neath Abbey is near the Neath Abbey ruins - another area that goes back in time. Neath Abbey was established in 1129 AD when Sir Richard de Granville gave 8,000 acres (32 km²) of his estate in Glamorgan, Wales to Savigniac monks from western Normandy. The first monks arrived in 1130. Following the assumption of the Savigniac order into the Cistercian order in 1147, Neath Abbey also became a Cistercian house. The abbey was ravaged by the Welsh uprisings of the 13th century, and eventually dissolved by King Henry VIII of England in 1539. At this time, the abbey was turned into a large estate. Sir Philip Hobby was the last occupant of the estate. The remains of the abbey are pictured left. As Neath developed and became more populated in the 19th century, entertainment was mainly provided at Vint's Palace, located on the site of the main Post Office on Windsor Road, until it was destroyed by fire in the late 1920's. Between 1926 and 1960 Neath had three cinemas, the Gnoll, Windsor and Empire. The latter, was built and owned by the Hedge family until they sold it to South Wales cinemas in the 1950's. The Empire building, the last remaining popular entertainment complex in Neath, was demolished for social housing flats in the summer of 2012, despite the wishes of many residents. Neath is proud of its Victoria Gardens, created in 1897 for Queen Victoria's Diamond Jubilee, and its £2m refurbishment, with help of the National Lottery Fund, which was completed in 2011. There is also the beautiful Gnoll Country Park, the rebuilt Gwyn Hall (reopened in March 2012) with its cinema and concert hall, which offer residents and visitors entertainment by operatic and dramatic art societies that have produced first class shows for many years. Neath Port Talbot was created from the former districts of Neath, Port Talbot and part of Lliw Valley on 1 April 1996 as Neath and Port Talbot; it changed its name on the following day, 2 April 1996. At the time of the reorganization, many local people expected that Neath and Port Talbot districts would become separate unitary authorities, and there were protests when the new authority was announced. Although now part of the Neath Port Talbot County Borough Council authority, Neath retains that charm of years gone by thanks to its general market – a rather special place that links the past with the present. Neath Town Council still exists and owns several properties within the town and has under its care the Neath Castle ruins. The town council, which has its own website, is funded by a precept arising from the council tax collected by NPT CBC. On the west side of the river Neath there is the Blaenhonddan Community Council which covers the communities from Neath Abbey to Aberdulais. This council, which has its own website, is also funded by a precept from NPT CBC. Perhaps it should be mentioned that with the demise of heavy industry, including the oil refinery at Llandacy, the quality of the air in Neath has improved. The nature of employment has changed with small industrial units springing up in the Neath Abbey district and other areas outside the town. Road transport took over the railways with the arrival of the M4 motorway, first to Baglan in the late 1960's, and then crossing the River Neath to Lon Las in 1993. The M4 linked to the Neath Valley dual carriageway and the heads of the valley road, making a further step in people travelling to Neath with road transport, giving families with their own cars a sense of freedom they never had before. The Neath Guardian was a local weekly newspaper published between 1925 and 2009 covering Neath, and the surrounding area. At the time of its closure, it was published weekly, on a Wednesday, in the tabloidformat by Media Wales (formerly Western Mail and Echo), part of the Trinity Mirror group. The newspaper had two editions: the Neath Guardian, which covered the town itself, as well as Briton Ferry, Skewen, and the communities of the Neath and Dulais valleys, and the Port Talbot Guardian, which covered Port Talbot, Baglan, Margam and the Afan Valley. The weekly news paper survived world war II but not the effects of the financial situation at the time of its closure in 2009. In 2014 the development of a new shopping centre commenced - said by many that is likely to change the character of the town. It would appear that the centre will be divided into two - the old and the new - this remains to be seen. It is interesting to note that the Neath Market has always been an attraction for neighbouring areas. Perhaps the most memorable method of transport in the late 1800's was the tram service that ran between Briton Ferry and Skewen, which was powered by town gas - Neath and Briton Ferry towns having two works producing gas from coal. The garage for the trams, which also recharged the gas storage cylinders, was where 'Town Tyres' have their depot today at London Road - near Victoria Gardens. The tram service started 36 years after Neath market was built in 1837 and ran until the early 1920's. The tram carried 42 passengers and travelled at 8 mph. It was coincidental that when the South Wales Transport, (buses left) having a large depot at Eastland Road, ran their bus service from Swansea to Margam some years later it had 42 stages and called 'Route 42'. Distance between groups of stops were known as 'stages' - a term presumably carried forward from the stage coach days. 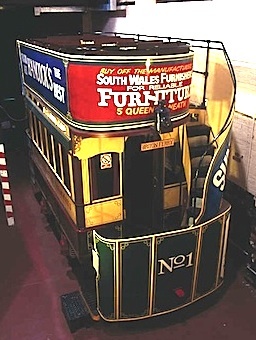 A restored gas tram (pictured above right), thought to be the only remaining one in the world, can be seen at the council's owned Cefn Coed Collery Museum at Crynant where the entrance is free. The route from Briton Ferry to Skewen was firmly established and the tram service was followed by a motor bus (pictured left). Later a local bus company, Richmond Buses, using Leyland double deckers (pictured right), ran a service on the same route - between the White Gates in Skewen to Villiers Street Briton Ferry. Another privately owned coach company, Creamline, based at Tonmawr, ran a service to Neath from Pontrhydyfen via the Cimla. The United Welsh bus company, with a depot at Neath Abbey, ran some local services, including one from Neath to Swansea via Jersey Marine. The Western Welsh bus company (a Cardiff firm formed in 1920) operated services from the forecourt of the Neath General (GWR) railway station with principle routes to Ammanford, Pontardawe and Porthcawl. A Western Welsh bus is pictured right - their depot was at Pontardawe. In 1930 Luxuary Coach express coaches (pictured left) ran from Neath to Cardiff with limited stops en route for a speedy service. The N&C had a depot at Briton Ferry and its service continued until 1970 when family cars became the main means of road transport. At one time Neath had four railway stations - now only one exists, which was built in 1877 and was later given the name 'Neath General' to distinguish it from the others. Of the others, one line served the Dulais valley and the Neath station was known as Neath Riverside (Neath Low Level) shown right with a main line train crossing the bridge ahead. The line was originally built to carry coal from the Neath valley to Swansea docks. The last surviving mine was the Tower Collery at Hirwaun, which closed in 2008. In the late 1940's this line was extensively used to carry students from the Dulais valley to the Neath Grammar School and the adjacent Neath Technical College. The gate to the station yard was said to be the widest gate of its type in the UK with only one hinge. The station closed in 1962. The Neath and Brecon Railway linked the Vale of Neath Railway at Neath with the Brecon and Merthyr Railway at Brecon and also via a connection from Colbren Junction, it linked to the Swansea Vale Railway at Ynysygeinon Junction. The Rhondda and Swansea Bay line, which opened in 1882, had a station in Cwrt Sart and ran to Swansea via a swing bridge over the river Neath. In 1895 a branch line was made to Neath (Neath Canel Side), giving the town a rail connection with the Afan valley and the Rhondda via the stations at Aberavon Seaside and Aberavon Town. The Neath Canal Side and Cwrt Sart stations closed in 1935, the year that the Briton Ferry station (pictured right) opened replacing Cwrt Sart, Briton Ferry East and Briton Ferry West, the two latter stations were at the bottom of Villiers Street, then the main shopping street in Briton Ferry. The line itself closed in 1962, much to the relief of Aberavon town and its railway gates on main road. The existing Neath General railway station, formerly belonging to the Great Western Railway (GWR), was long famous for its Victorian features until it was refurbished in the 70/80's. The rail station is very conveniently close to the Neath market and with the restored railway stations at Briton Ferry and Skewen is providing a modern day alternative to the motor car for shopping in Neath. As a summary, it must be said that there were many changes over the years in the stucture of the South Wales rail network from being privately owned to later being grouped under the GWR banner before being nationalised in 1948 as British Railways. In the 1960's the Beeching axe took place with only main lines left to major towns such as Neath. Written and compiled by Cled Griffin - April 2012. Updated September 2014. The feature will be continued after being checked at Neath archives. Further photographs will be included as and when they become available.